This irresistible dessert can be served in two ways. You can smother the freshly cooked crisp hot doughnuts with the cold, smooth, fruit-studded yogurt for an experience of contrasting textures and temperatures. Alternatively, if you leave the doughnuts in the yogurt, they swell up and become succulent, soft and spongy, drinking up the juices and flavours of their sauce. The choice is yours. Serves 6-8.
ghee or oil for deep-frying. 2 punnets fresh berries, about 500g, sliced. For the doughnuts: Mix together the flour, fennel and sugar in a bowl. Gradually whisk in the water and teaspoon of yogurt until the mixture becomes a fairly thick batter. Allow the batter to rest for 10 minutes. 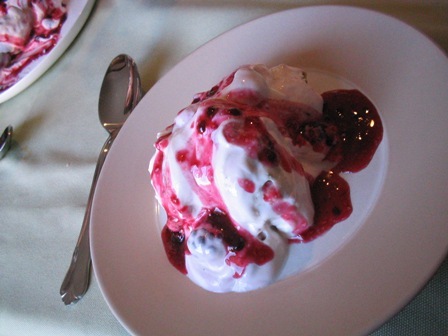 For the sauce: whisk together the yogurt and sugar and fold in the berry pieces. Set aside. Heat ghee or oil in a wok or deep pan over moderate heat. When fairly hot (about 160° C/ 320° F) spoon out tablespoonfuls of batter, and with the aid of a second spoon, scoop the batter into the hot oil. Fry as many cakes as can be comfortably fried at one time – remember they swell as they fry. Turn and cook them evenly, for 2 or 3 minutes on each side, or until light golden brown. Remove and drain on paper towels. Continue frying until all the batter is used up. Serve the doughnuts hot, smothered with the berry yogurt, or leave them to plump up and soak. Note: try these alternative flavours – other fresh berries of your choice, banana, passionfruit, mango, kiwifruit or papaya.